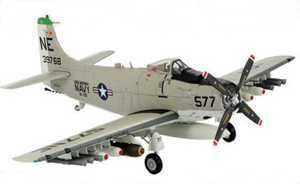 YellowAirplane.com: A-1 Skyraider Military Aircraft Models, DieCast, Wood and Plastic Model Airplane Kits. DieCast, Wood and Plastic Aircraft Models Kits. Diecast, madera y plastico kits de aeromodelismo. A1 Skyraider, Military, Viet Nam War Fighter Aircraft. of the Propeller Fighter Aircraft Models Department. 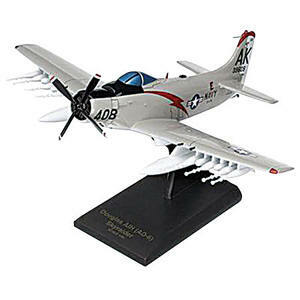 The Douglas A-1 Skyraider shown in this propeller driven aircraft model fighter aircraft page come in Plastic Models, Wooden Models, and both Wood and Mahogany Display Model Aircraft. 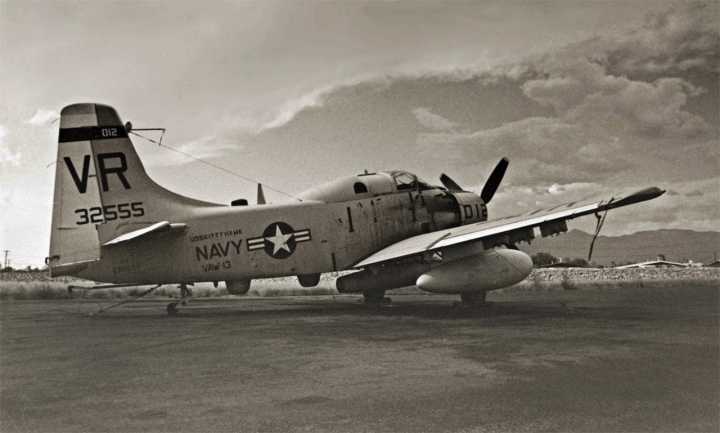 One nickname for the Skyraider that never took was the pulverizer. Other nicknames were the SPAD, AD Able Dogs, or in their rescue work they were known as Sandy. They were used as slow, all weather, close ground support with their loiter for long periods and also carry large payloads. The U.S. Air Force lost 153 Skyraiders were lost in Viet Nam between 1962 and 1973. Another 41 were listed as operational losses. 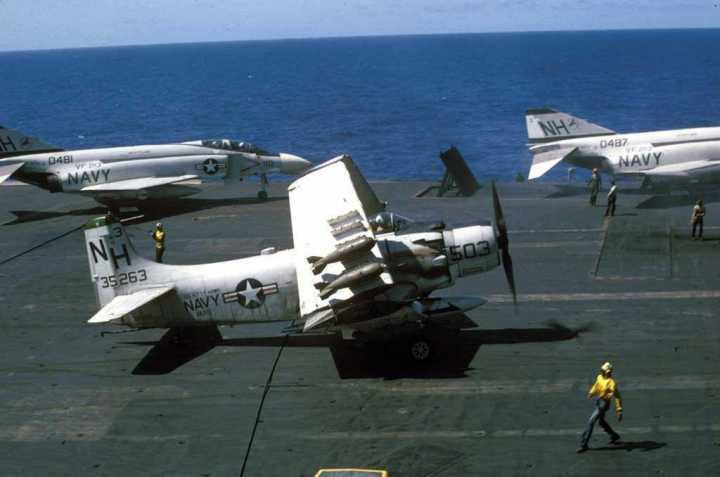 146 of the U.S. Air Force Skyraiders were lost due to ground fire, 2 to MiGs, 3 to Sams, and 2 in attacks to airfields. They were also used as escorts for rescue helicopters. Overall losses of aircraft were 57%, for Skyraiders the losses were 75%. "A marvel." - The New York Times. Based on a true story, this 2007 film stars Christian Bale as Captured and tortured, he organizes an escape with a small band of POWs. Can the men survive the dangerous jungle and their pursuers? Widescreen, Dolby Digital, Rated PG-13. 2 hrs. 6 min. "Unforgettable… astonishing." - Roger Ebert. This riveting documentary follows the lifelong desire of Dieter Dengler to fly airplanes, from his childhood in Nazi and post-war Germany through his immigration to America at age 18, his enlistment in the Air Force and then the Navy, his service flying AD Skyraider attack bombers in Vietnam, his capture by Pathet Lao troops after being shot down, and his incredible escape. Widescreen, Dolby Digital 2.0, 1 hr. 14 min. This 1991 film, based on Stephen Coonts' novel, stars Danny Glover, Willem Dafoe and Brad Johnson as A-6 pilots during the Vietnam War. Filmed with cooperation from the U.S. Navy (including on board the USS Independence ), the film features A-6 Intruders, A-4 Skyhawks, A-1 Skyraiders and an H-53 Sea Stallion helicopter, and even shows footage from under the catapult and along the catwalks during flight operations. Widescreen, Dolby Digital 5.1, Rated PG-13. Color, 1 hr. 54 min. This 1982 action film stars Clint Eastwood as a U.S. pilot who sneaks into Russia to steal a highly advanced Soviet fighter aircraft - the mythical MiG-31, NATO code name "Firefox" - that is capable of Mach 6, is invisible to radar, and carries weapons controlled by thought. Filled with great aerial sequences, this film includes aircraft such as the MH-53 Pave Low, F-105 Thunderchief, F-4 Phantom II, A-1 Skyraider, F-5E Tiger II, F-111 Aardvark, T-38 Talon, Tupolev Tu-154 and Tu-16, and others. Widescreen, Dolby Digital, Rated PG. 2 hrs. 16 min. Strap in for a pulse-pounding Korean War adventure with the USAF's 51st Fighter-Interceptor Wing. You'll view thrilling footage of F-80s dive-bombing with napalm; dogfights between F-86 Sabres and MiG-15s; U.S. Navy F4U Corsair, Skyraider and F9F Panther low-flying missions; World War II 28-victory ace Col. Francis Gabreski as he returns from his 5th victory mission in his F-86; gun camera film of MiG-15s under attack; and much more! Color and B&W DVD, 1 hr. 57 min. This video features narrated and silent film footage taken aboard USS Forrestal (CV-59) in the 1950s and 1960s. It includes film footage from the commissioning, shows above and below-deck, lots of flight deck operations. Includes VF-74, the Be-Devilers. The first film, produced in 1956, shows the commissioning and construction of the Forrestal, including flight deck activity and below deck footage. It is narrated. The second film, titled "Jet Carrier," is narrated. It details flight deck operations aboard Forrestal operating with the 6th Fleet in the 1950s and features Skyraiders, Demons and Skyhawks. Certainly, one of the best films ever produced with regard to capturing the intense action on the flight deck. The next narrated film is from the late 1950s with Capt. Richard E. Kibbe, commanding officer. Lots of flight deck activity. It shows A-4 Skyhawks launching and landing and performing aerial maneuvers. Also shows the Forrestal being refueled by the destroyer Charles R. Ware, DD-865. Silent film footage follows showing a C-130 landing and taking off from the Forrestal in 1963. The next film on the video, "Phantom Joins The Fleet," is narrated and focuses on the F-4H Phantom operations aboard Forrestal. This film by the aircraft manufacturer, McDonnell, notes the air wing is VF-74, the Be-Devilers. Tom Freeman. 28"x 22" limited edition print is signed and numbered by the artist. 16"x 11½" signed and numbered limited edition print. A USN Skyraider returns to its floating home during the Vietnam War. This limited edition Giclée print, edition size of 100, measures 20"x 15" and is signed and numbered by the artist. A soldier breaks cover to be rescued by an HH-53 Super Jolly helicopter crew while Douglas A-1 Skyraiders provide protective cover. 28"x 20" limited edition print is signed and numbered by the artist. A-1H Skyraider "Spad Dad" flown by the 6th Special Operations Squadron in Vietnam AD-4 Skyraider flown by VA-195 commanding officer Harold "Swede" Carlson when he led the "Tigers" on the only aerial torpedo attack of the Korean War (the successful May 1, 1951, torpedo attack on the heavily-defended, 250-foot-tall Hwachon Dam - an action that earned the group a new nickname, the "Dambusters") The tough and versatile Skyraider was among the final piston-powered, prop-driven attack planes produced before the dawn of the "jet age. "Forrestal operating with the 6th Fleet in the 1950s and features Skyraiders, Demons and Skyhawks AD Skyraider, which was the workhorse of the U.S. Navy during the Korean War A-1H Skyraider flown off the USS Midway (CVA-41) by Lt. Clint Johnson of VA-25, "The Fist of the Fleet" (the U.S. Navy's last operational Skyraider attack squadron) when he shot down a MiG-17 over North Vietnam on June 20, 1965 A-1J Skyraider flown by Lt. (jg) Dieter Dengler of the U.S. Navy's VA-145 "Swordsmen" when he was shot down over Laos during his first combat mission on February 1, 1966 (he was captured by Pathet Lao forces and later became one of only a handful of Vietnam War POWs to escape from captivity)To commemorate the 6 millionth pound of U.S. ordnance dropped during the Vietnam War, the A-1H Skyraider "Paper Tiger II" - flown by Commander Clarence W. Stoddard, Jr., the executive officer of the VA-25 "Fist of the Fleet" - carried a special bomb to the North Vietnamese: a large ceramic toilet. Talk about giving new meaning to the phrase, "bombs away!" In 1965, when U.S. air operations in Vietnam became more aggressive, more than 300 Skyraiders were employed on Close Air Support and Combat Search and Rescue (CSAR) missions. an A-1J Skyraider flown by the commander of the 602nd Special Operations Squadron, 56th Special Operations Wing, when it flew out of Nakhon Phanom Royal Thai AFB, Thailand, in the late 1960s Col. Bernie Fisher was awarded the Medal of Honor for this rescue mission in the A Shau Valley in March 1966, where he landed his Skyraider on the heavily damaged field to rescue a squadron-mate. With A-1 Skyraiders and A-4 Skyhawks providing close air support, Lt. Hal Moore and the troopers of the 1st Battalion, 7th Cavalry Regiment, 1st Cavalry Division stand their ground during the battle of the la Drang Valley, Vietnam, 1965. The Skyraider was one of the U.S. Navy's most successful and versatile aircraft ever - and it was also its last piston-engined fighter-bomber. A-1 Skyraider Specifications. The A-1E Skyraider was 40' 1" long, 15' 10" high and had a wingspan of 50' 9". The Skyraider had an empty weight of 12,313 lbs and a maximum weight of 25,000 lbs. It used 1 Wright R-3350-26WA 2700 hp radial engine giving it a cruise speed of 200 mph and a maximum speed of 311 mph with a climb rate of 2,300 ft/min and a service ceiling of only 26,000 feet. The A-1E had a maximum range of 1,202 miles. Later versions the A-1J used a Wright R-3350-26W engine with 3020 hp with a maximum speed of 322mph and range of 1,316 miles. Mutza. Thanks to its remarkable service during the war in Southeast Asia, the Skyraider became legendary. Serving with distinction with both U.S. and South Vietnamese forces, the Skyraider took the war to the enemy, often at low altitude and in the face of devastating losses from anti-aircraft fire. Skyraider missions covered the spectrum, from dive and torpedo bomber, to airborne early warning aircraft, to flying ambulance, to aerial tanker, to fighter. The A-1 performed all of these rolls with distinction. To commemorate the 6 millionth pound of U.S. ordnance dropped during the Vietnam War, the A-1H Skyraider "Paper Tiger II" - flown by Commander Clarence W. Stoddard, Jr., the executive officer of the VA-25 "Fist of the Fleet" - carried a special bomb to the North Vietnamese: a large ceramic toilet. Talk about giving new meaning to the phrase, "bombs away!" The tough and versatile Skyraider was among the final piston-powered, prop-driven attack planes produced before the dawn of the "jet age." The Skyraider was one of the U.S. Navy's most successful and versatile aircraft ever - and it was also its last piston-engined fighter-bomber. With A-1 Skyraiders and A-4 Skyhawks providing close air support, Lt. Hal Moore and the troopers of the 1st Battalion, 7th Cavalry Regiment, 1st Cavalry Division stand their ground during the battle of the la Drang Valley, Vietnam, 1965. Col. Bernie Fisher was awarded the Medal of Honor for this rescue mission in the A Shau Valley in March 1966, where he landed his Skyraider on the heavily damaged field to rescue a squadron-mate. U.S. Navy pilot Dieter Dengler, who is shot down while flying a Skyraider combat mission over Laos in 1965. A-1 Skyraider Specifications. The A-1E Skyraider was 40' 1" long, 15' 10" high and had a wingspan of 50' 9". The Skyraider had an empty weight of 12,313 lbs and a maximum weight of 25,000 lbs. It used 1 Wright R-3350-26WA 2700 hp radial engine giving it a cruise speed of 200 mph and a maximum speed of 311 mph with a climb rate of 2,300 ft/min and a service ceiling of only 26,000 feet. The A-1E had a maximum range of 1,202 miles. Later versions the A-1J used a Wright R-3350-26W engine with 3020 hp with a maximum speed of 322mph and range of 1,316 miles. These Aircraft models show all kinds of A-1's in Die Cast Models, Plastic Model Kits, Mahogany Models and Wood Model Kits. Please Note: The specifications on this page are only for a single model of this A1 aircraft other models of the A1 may vary. This remarkable fighter-bomber, designed at the end of WWII but first in action over Korea, saw service through the Vietnam War and even into the mid-1970s in minor conflicts in Africa. The Skyraider served in war and peace for over two decades. The Skyraider took place in exciting combat action of the 'Spad’s' first air attacks of the Korean war to rescue missions in Vietnam. After the last battle of the last war, the 'Skyraider' is "piped-over." Avionsku modeli od A-1 Fighter Skyraider propeler zrakoplova, Vijetnam vijeku. Modely letadel A-1 Skyraider Vrtule sthacch letounů, Vietnam Era. Flyvemaskinen Modeller af A-1 Skyraider Propel jagerfly, Vietnam Era. Vliegtuig Modellen van de A-1 Skyraider Propeller Fighter Aircraft, Vietnam Era. Airplane Models ng A-1 Skyraider elise manlalaban sasakyang panghimpapawid, Vietnam Era. Lentokone mallit A-1 Skyraider Potkuri Fighter Aircraft, Vietnam Era. Modles d'avion de la A-1 Skyraider hlices des avions de combat, le Vietnam Era. Flugzeug-Modelle der A-1 Skyraider Propeller Fighter Aircraft, Vietnam Era. Airplane μοντέλα της Α-1 Skyraider Propeller μαχητικών αεροσκαφών, το Βιετνάμ εποχή. מטוס מודלים של A-1 Skyraider פייטר מטוס מדחף, וייטנאם הספירה. ने एक के वायुयान मॉडल-1 Skyraider प्रोपेलर लड़ाकू विमान, वियतनाम काल. Model pesawat dari A-1 Skyraider kipas Fighter Aircraft, Vietnam Era. Modelli di aereo A-1 Skyraider Propeller aerei da combattimento, il Vietnam Era. A 급 모델의 비행기 - 1 Skyraider Propeller 전투기, 베트남 시대. Lidmašīna modeļi A-1 Skyraider propellera Fighter Lidmašīnas, Vjetnama ERA. Lėktuvas Modeliai A-1 Skyraider Laivasraigtis kovotojas Orlaiviai, Vietnamas eros. Fly modeller av A-1 Skyraider Propeller jagerfly, Vietnam Era. Modele samolot A-1 Skyraider Śruba samolot myśliwski, Wietnam Era. Os modelos de avio A-1 Skyraider Hlice Fighter Aircraft, Vietn Epoca. Avion de la modelele A-1 Skyraider Fighter elice de aeronave, Epoca Vietnam. Самолет модели А-1 Skyraider винт истребителя, Вьетнам эры. Авионску модели од А-1 Фигхтер Скыраидер Пропелер авиона, Вијетнам вијеку. Modely lietadiel A-1 Skyraider Vrtuľa sthacch lietadiel, Vietnam Era. Letalo Modela A-1 Skyraider propeler Fighter Zrakoplovi, Vietnam Era. Modelos de avin de la A-1 Skyraider hlice, aviones de combate, era de Vietnam. Flygplan Modeller av A-1 Skyraider Propeller stridsflygplan, Vietnam Era. Літак моделі А-1 Skyraider гвинт літака-винищувача, В'єтнам ери. Cc m hnh my bay của A-1 Skyraider Propeller Fighter my bay, Việt Nam Era.